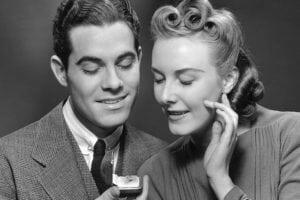 Getting the perfect diamond for your girlfriend is only half the job: You also have to figure out the setting. Part of that will be covered by your engagement ring espionage efforts. But you should have a good grasp of the different types of settings before you make your final purchase. What is a setting, you ask? If the diamond is a priceless painting, the setting is the frame you put it in. 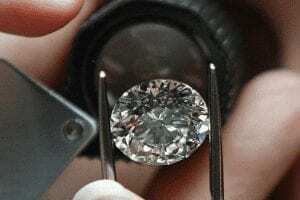 Picture an engagement ring and then remove the stone. The metal shell, including the part that holds the diamond in place, is the setting. 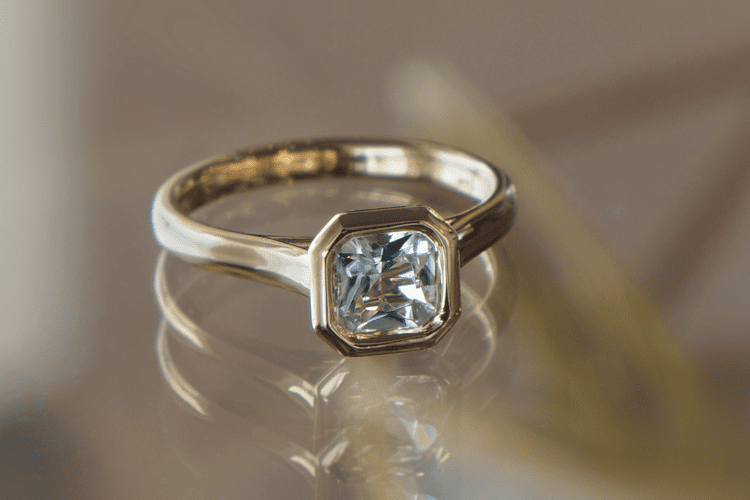 You don’t have to buy the setting from the same place you buy the diamond, but reputable dealers like Blue Nile make the process easy, allowing you to try out different combinations of diamond and setting before buying. Here’s a rundown of the most common setting styles, so you’ll know exactly what she’s talking about, should the topic arise. Designers are always introducing new setting variations, so use this list as a guideline only. A solitaire engagement ring features a single stone of any shape. The most popular example of this is the “Tiffany setting,” which was introduced by Tiffany’s way back in 1886. In a Tiffany setting, a single round cut diamond sits high above the band, with six claw-like prongs holding it place. 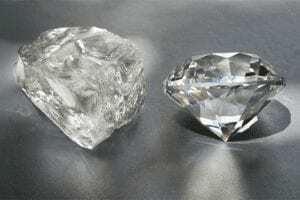 Some pros and cons: When the diamond sits high on the finger, more light is able to pass through it, making it brighter. On the other hand, it’s more vulnerable to damage. The claw-shaped prongs of a Tiffany setting are the most unobtrusive but they have a tendency to snag and catch on clothing. 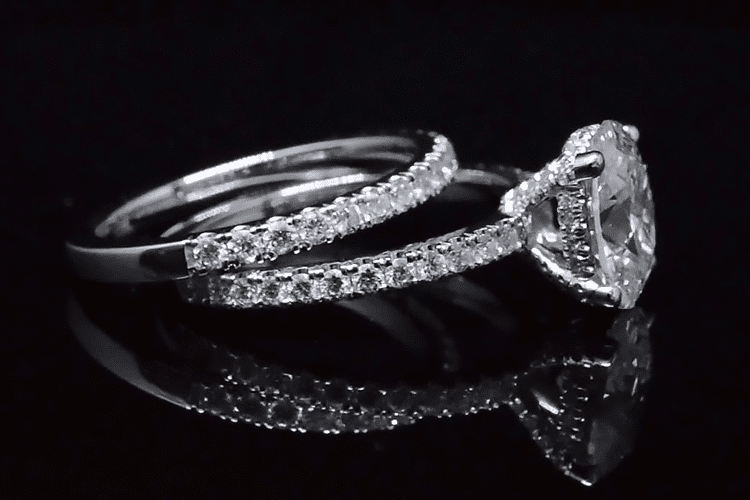 See if rounded, or V-shaped prongs work better with your stone’s shape. The “safety first” option. 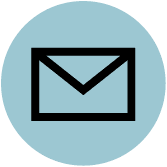 A bezel setting is a solitaire in which the diamond is surrounded with a metal border, which protects the stone from damage and keeps it secure. A bezel creates a smooth, streamlined look, eliminating edges and angles, making it a good choice for minimalist-minded females, women who work with their hands (e.g., surgeons, chefs, landscape architects), or those who lead a particularly active lifestyle. The disadvantage to the bezel setting is that the diamond won’t get as much light. But some women like to keep a low profile anyway. In a halo setting, the center diamond is encircled by one or more “halos” of smaller diamond accent stones. This beefs up the appearance of the center diamond considerably, which is a smart way to score a bigger look for less. This style appeals to brides who want bling and glamor. 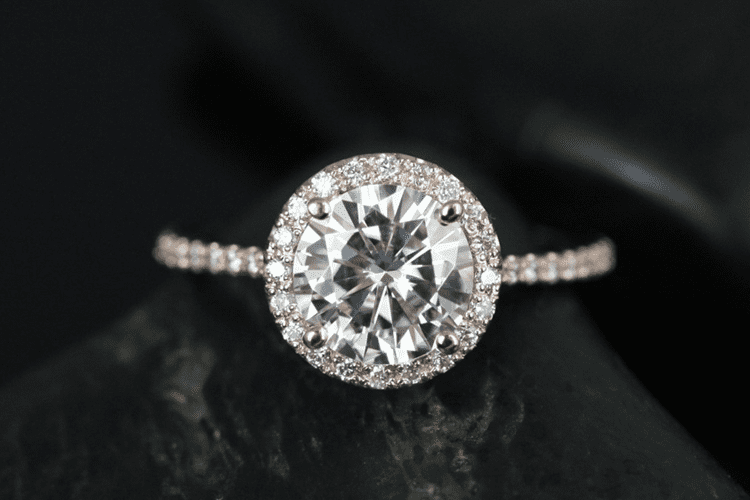 Halos can be created to frame a variety of stone shapes and cuts; you can also mix shapes (say, an octagonal halo surrounding a round diamond center stone). 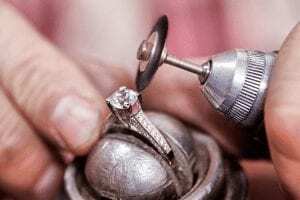 The three-stone look had a big moment in the late 1990s—it was marketed as a way to commemorate a couple’s past, present and future—and people still go for it. Typically, this design features a center stone flanked by two slightly smaller diamonds in the same shape. If you go for the three-stone look, make sure all three stones are of comparable color and clarity–otherwise it will look like you just jammed three random stones into one ring. No, we’re not talking about a filed-down mess hall spoon for her to stab you with, prison riot-style. 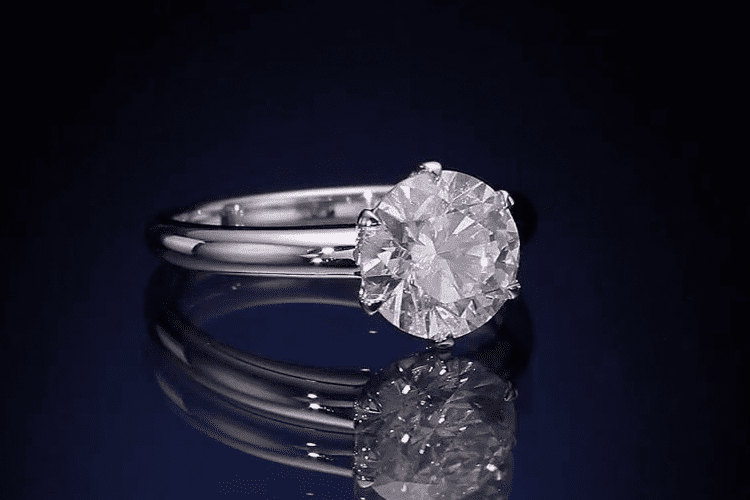 The shank is another name for the engagement ring’s band, which is sometimes decorated with small diamonds in order to enhance the shine of the large center stone. 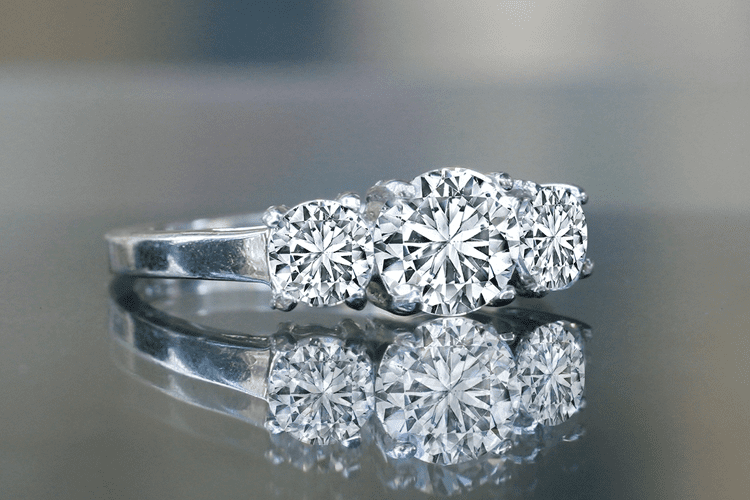 Channel-set diamonds (the stones trail down each side of the ring) or pavé diamonds (super small stones, with no visible metal in between or around them, for an all-over “encrusted” look) are two of the most common ways to amp up a standard engagement ring setting so that it sparkles from all angles. Maybe she wants the shank to be bare metal, maybe she wants it to shine bright enough to be seen from space. Your job is to determine which. The setting is almost as important a decision as the diamond. You’ve got to know your options, and which style is going to make your girl’s heart flip.